Dane Chris Anker Sørensen took his first big win in cycling at the top of Monte Terminillo today. He rolled the dice in the eighth stage of the Giro d’Italia and it paid off. The overall favourites made Sørensen’s win slightly easier as they were licking their wounds from yesterday’s mud bath to Montalcino. Still, the 25-year-old had to fight in the final kilometres of the 16.1-kilometre long climb to make his escape pay off. Sørensen came to the Giro d’Italia as the leader of Danish team Saxo Bank, even if he had just recovered from a broken right collarbone seven weeks prior. He took advantage of his improving form and the freedom given to him by going in an escape at 76 kilometres into the cold and dreary 189-kilometre stage. He had 16 other companions, including Sky’s Steve Cummings and Chris Froome, but they dropped off one by one. Sørensen now had a chance at not only a win, but a solo win ahead of the charging group of favourites. Vincenzo Nibali’s Liquigas and Alexandre Vinokourov’s Astana called a truce in the classification battle. 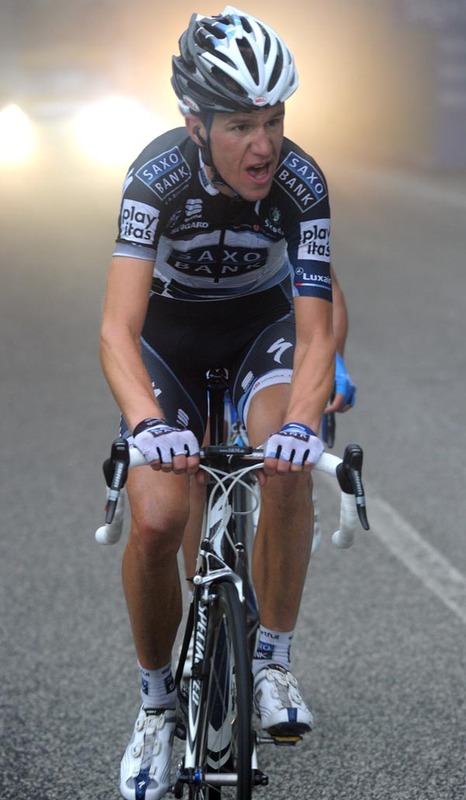 Instead, Sørensen held off the charge by Damiano Cunego’s Lampre team to win by 36 seconds over the favourites’ group, led by Cervélo’s Xavier Tondo. Monte Terminillo was Sørensen’s biggest win and his first win since last year’s Japan Cup. “I was not sure our escape would stay away. I tried to keep the tempo up ahead of the climb. I knew I had to have some sort of gap to the big favourites to stay win,” continued Sørensen. Cunego finished second to Evans in yesterday’s stage to Montalcino, marked by gravel roads that turned to mud from the day’s rain. Every rider who crossed the line looked like a zombie yesterday, including Nibali who crashed and lost the leader’s pink jersey. Today, the favourites seemed to be thinking of the race’s final week, the mountain stages through the Dolomites and Alps. They were thinking of the Plan des Corones, the Zoncolan, the Mortirolo and the Gavia climbs, not the Monte Terminillo. 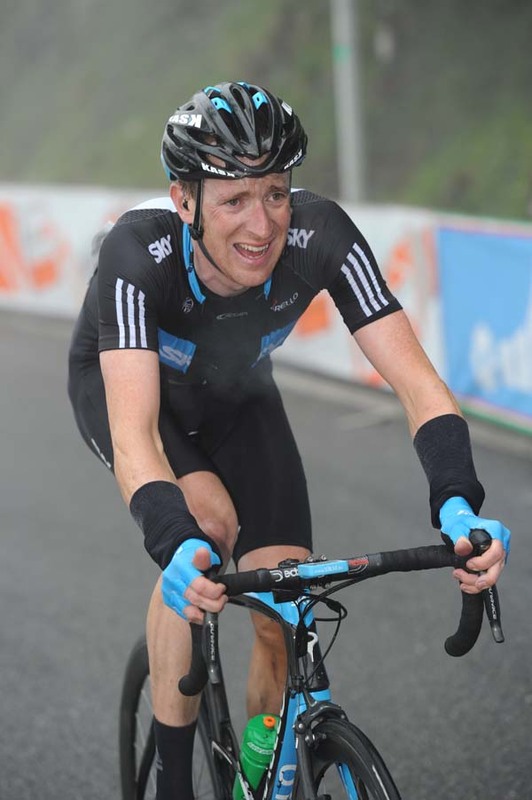 Britain’s Bradley Wiggins (Team Sky) stayed in contact with the maglia rosa group most of the way up the final ascent, and came home in 16th, one minute and 22 seconds behind Sørensen. Wiggins now sits in 23rd place overall, nine minutes and five seconds adrift of Vinokourov. It all bodes well for the Sky man’s Tour de France preparations. David Millar (Garmin-Transitions) fared less well. The Scot started the stage in third place overall, but lost 17 minutes and 55 seconds to stage winner Sørensen and slipped down to 33rd. Italian spinter Alessandro Petacchi (Lampe) decided to call it a day during the stage after suffering with an illness and having scored no wins – as the Italian press have been keen to point out. He was one of several to abandon during the day, leaving 183 riders in the race. 10. Ivan Basso (Ita) Liquigas-Doimo at same time.